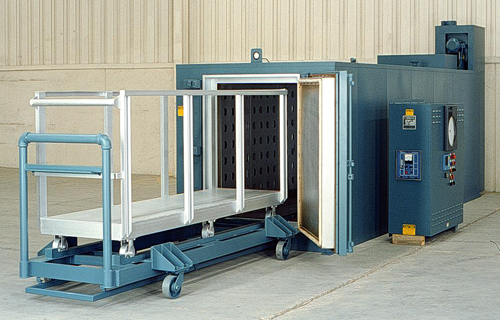 Grieve Corporation in the US announced that No.821, a 650°F electric inert atmosphere walk-in oven, has been delivered to a customer for annealing plastic rods. Workspace dimensions inside this unit measure 36″ wide x 156″ deep x 48″ high. 80kW power is installed in Incoloy sheathed tubular heating elements, while a 7,800CFM, five HP recirculating blower provides horizontal airflow across the workloads. An aluminized steel exterior and interior are featured on this unit, which also includes 5″ thick insulated walls throughout. Special construction for inert atmosphere processing includes all the following components: pressure regulator, flowmeter, pressure gauge, internal high-temperature gasketing, bellow-type doorway seal, 1/2″ thick cellular silicone rubber atmosphere seal, blower shaft seal, positive latching door hardware, adjustable offset door hinges, outlet with pressure relief, interior seams welded gas-tight and all wall penetrations equipped with compression fittings. An additional 1500 CFM blower is furnished to pull air through an air jacket on the inner oven for cooling. An oxygen analyzer, 0-5% range, is also provided on this oven. A flatbed loading truck with 3,500lb capacity and integral channel support sides, plus a transfer dolly with oven-to-dolly and dolly-to-truck latches, was also provided.